Polbase - Reference: Structure of Taq polymerase with DNA at the polymerase active site. 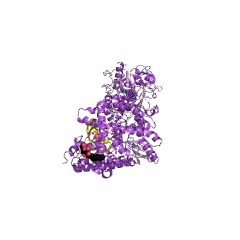 Structure of Taq polymerase with DNA at the polymerase active site. The DNA polymerase from Thermus aquaticus (Taq polymerase) is homologous to Escherichia coli DNA polymerase I (Pol I) and likewise has domains responsible for DNA polymerase and 5' nuclease activities. The structures to the polymerase domains of Taq polymerase and of the Klenow fragment (KF) of Pol I are almost identical, whereas the structure of a vestigial editing 3'-5' exonuclease domain of Taq polymerase that lies between the other two domains is dramatically altered, resulting in the absence of this activity in the thermostable enzyme. The structures have been solved for editing complexes between KF and single-stranded DNA and for duplex DNA with a 3' overhanging single strand, but not for a complex containing duplex DNA at the polymerase active-site. Here we present the co-crystal structure of Taq polymerase with a blunt-ended duplex DNA bound to the polymerase active-site cleft; the DNA neither bends nor goes through the large polymerase cleft, and the structural form of the bound DNA is between the B and A forms. A wide minor groove allows access to protein side chains that hydrogen-bond to the N3 of purines and the O2 of pyrimidines at the blunt-end terminus. Part of the DNA bound to the polymerase site shares a common binding site with DNA bound to the exonuclease site, but they are translated relative to each other by several angstroms along their helix axes.